Monday, March 26, 2012, marks the 86th day of the year. It is the day that “Avatar” and “Titanic” director, James Cameron, dives nearly seven miles in a specially-designed submarine called the “Deepsea Challenger,” 200 miles southwest of the Pacific Island of Guam in the Mariana Trench. The same day, far away in Santa Fe, New Mexico, in a school gymnasium transformed into a “Special Education Resource Fair” by many creative Santa Fe Public School personnel, a plain white table is reserved for representatives of Las Campanas Compadres. They are invited to illustrate their program activities to the community of special needs families with an informational display. Their assignment is to spread the word to the nearby communities about the exciting riding and swimming adventures just waiting for disabled people of all ages. 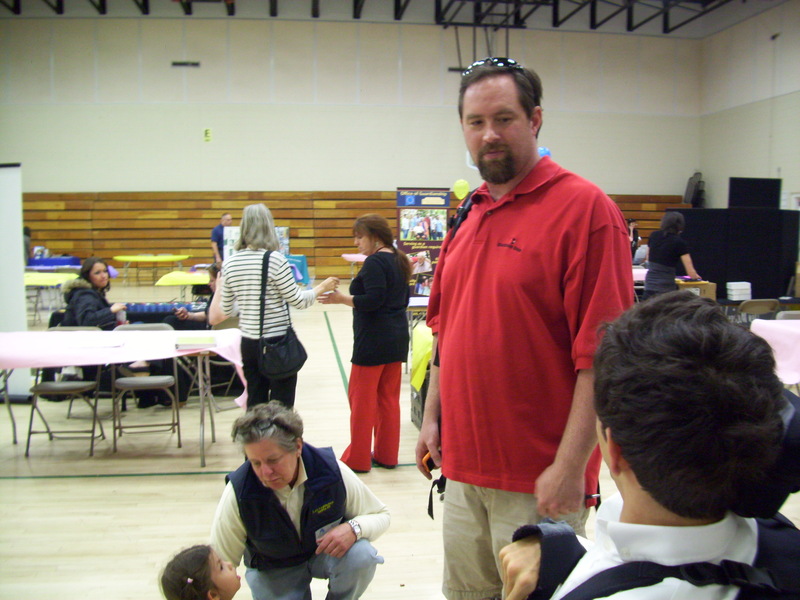 Most of the attendees of the resource fair are families with children who are enrolled in Santa Fe’s special education school programs. 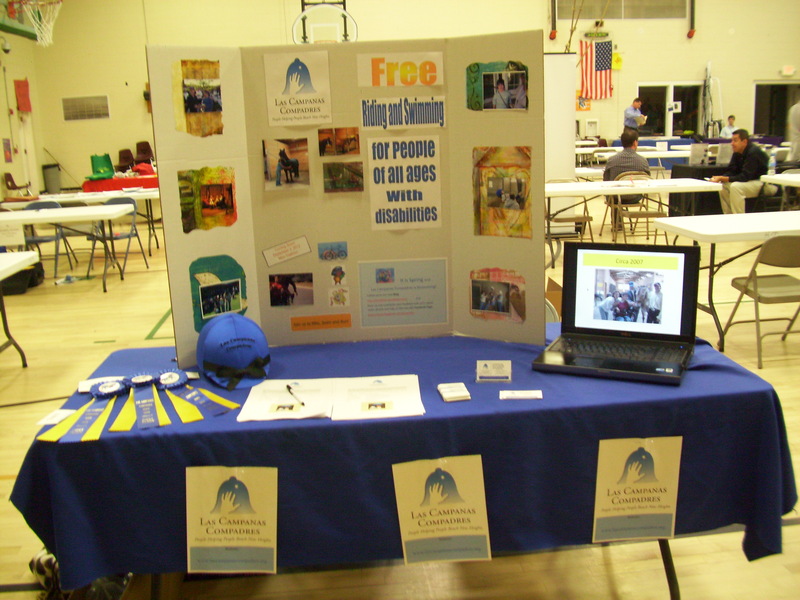 In addition to telling families about the free riding and swimming programs at the resource fair, the LCC representatives have the opportunity to invite people to become volunteers to keep the programs strong. They announce to possible swimming, bicycling and running participants the initial details of this year’s upcoming September 3rd Mini-Triathlon. Other agencies participating as “vendors” at the fair learn about Las Campanas Compadres and promise to tell their own clientele and members of their groups about LCC. Families with children excited about riding horses and swimming see the display photos and the Power Point presentation and are incredulous Las Campanas Compadres programs are free, and in such beautiful facilities. They take the business cards and the flyers indicating they will do more research. They plan to call 505-820-2707 to speak to the program founders as they start planning for extracurricular activities that will help their children to exercise, to reach developmental goals, and most of all, to have fun. Dave Caldwell and Georgia Smith, LCC swimming and riding instructors, are the best. For three consecutive years at this resource fair, they have provided their expertise and “pizzazz” speaking to inquiring families. Enthusiasm abounds and for two hours, many questions about LCC programs are asked and answered. It is an exceptionally good day to tell the community about the Las Campanas Compadres programs and introduce them to new, undiscovered territory that promises to add a positive dimension to their lives. The 2012 Special Education Resource Fair is Today!!! Today Las Campanas Compadres will have a table at Aspen Community Magnet School, 450 La Madera, Santa Fe, NM to tell families about our free riding and swimming programs. The third annual fair will be from 4:30 – 6:30 pm. There will be door prizes, displays, give-away freebies, and a great chance to see what the Santa Fe community has to offer the special needs population. We are so proud of Las Campanas programs and want area families to meet Georgia Smith, and Dave Caldwell our certified, and talented riding and swimming instructors. We encourage any volunteers and families who already participate in Las Campanas Compadres (past or present) to come by and help us tell folks about Las Campanas Compadres. Red Flag Reminder for Photos! It’s time… The display is going up! We need your photos! Carole Berger contributes her riding expertise (and snappy sense of humor) to LCC. She is one of the Las Campanas Compadres 2011 recipients of the Ron Walters Award. Many of our volunteers donate their time in the community to contribute their talents to more than one worthy agency. LCC is blessed to have her. “Mad Dog” Romero needs you to share your favorite photos! He is planning for the upcoming March 26, 2012 Special Education Resource Fair. He is designing a photo display for the Las Campanas Compadres table and needs your help. John’s goal is to feature LCC volunteers, participants and/or their families having fun at riding, swimming, the mini-triathlon or any other LCC activities. You can go back in your files as far as the beginnings of the organization (2007). It will be fun to see how everyone has changed and how the children have grown up over the years. Help John make this year’s LCC display at the fair the best so far. He would love to feature your favorite Las Campanas Compadres photos on the display poster. He will select the top 10 pics. However, all images will be treasured, and will be placed online in LCC Facebook photo albums. Please send your digital images for the poster design to lccompadres@juno.com by March 23rd . Thank you for your help to let the community know more about Las Campanas Compadres. Las Campanas Compadres was well-represented on Thursday morning when Valerie Espinoza hosted a taping of her show: “Santa Fe County Today”. On the 8th of March, the LCC panel was excited to appear on the show to communicate to the local community about the organization and to tell how the locals can take part to keep it strong and growing. The new Albertsons Community Card was presented to Valerie, and the Amazon link on the LCC website was discussed on air to illustrate some creative not-in-your-face fundraising programs for LCC. It had been about a year and a half since a first look at LCC took place on a “Santa Fe County Today” episode. Las Campanas Compadres facts were skillfully unveiled by Valerie Espinoza’s interview techniques. That August, after the first show,Valerie was emphatic that she wanted her new Las Campanas Compadres to return to her show. She said the first half-hour time period was not enough to discuss all the aspects of LCC, and she thought it was important Santa Fe area citizens hear what LCC is doing to provide activities and to encourage the disabled population and their families. 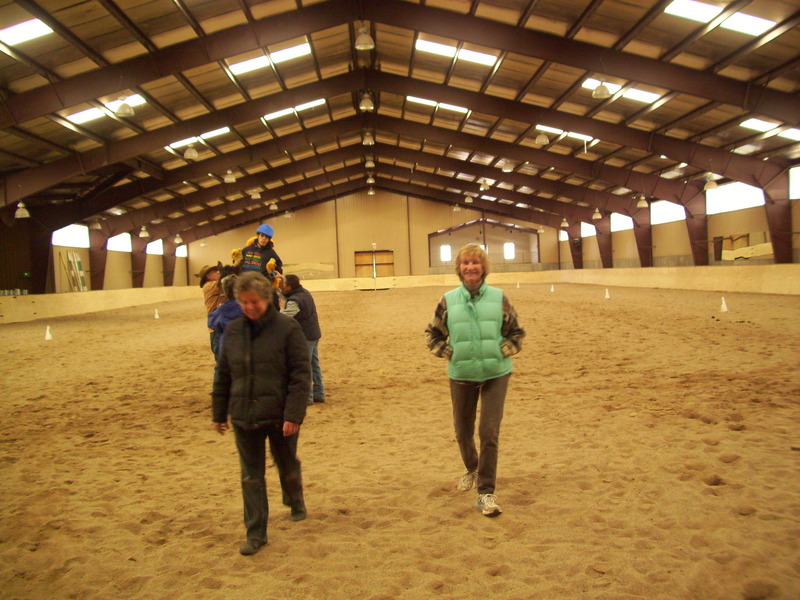 Meanwhile, since the first show, Valerie and her friend, Vicky, visited the LCC riding program at the barn one Monday, and witnessed LCC’s specialized saddle in action. Valerie saw for herself what exceptional fun LCC’s therapeutic riding program is for riders and volunteers alike. Valerie Espinoza is a busy lady. 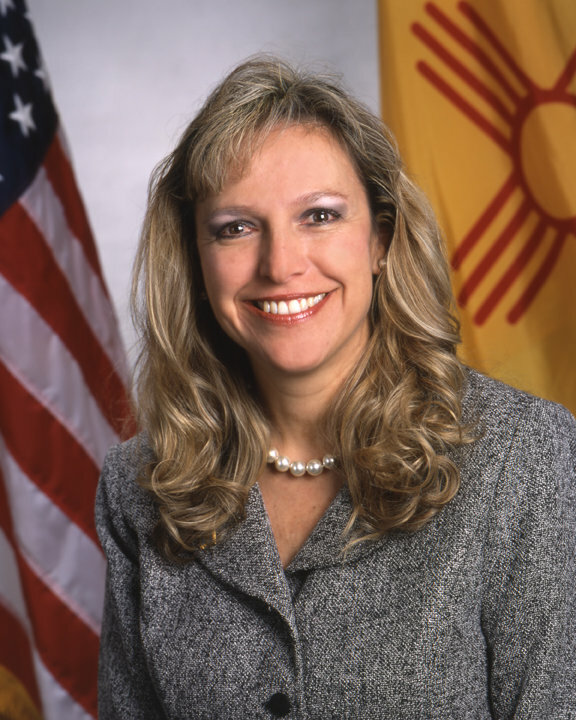 She is the current Santa Fe county clerk who is also on the June, 2012, District 3 Democratic primary ticket for the Public Regulation Commission seat. 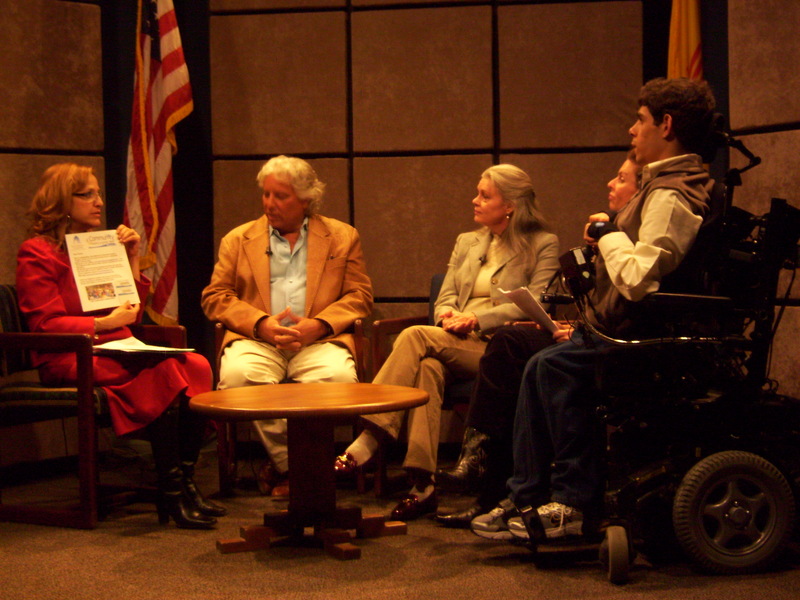 On the morning of the recent interview, LCC founders, Lawrence and Suzanna Becerra, Pam Franco from “The Club at Las Campanas,” and John (Mad Dog) Romero, newest board member, and an LCC participant since 2007, gathered with immense energy, at the Santa Fe Community College television studio to tape a second show to inform the public about Las Campanas Compadres. They were well-prepared for the show to tell about the founding of Las Campanas Compadres, its benefits to the community, and LCC’s upcoming events. Valerie’s show is such a great opportunity to tell local people about the good things Las Campanas Compadres has to offer to disabled people and their families in the Santa Fe area. Before the adept technicians did their microphone audio tests, and the expert cameraman was ready to roll, there was a nice surprise: Dave Caldwell, LCC’s swim instructor, stopped by (he works hard at SFCC, as well as in the LCC pool), and introductions were made all around. Soon, all was prepared on the set, and the interview began. Besides reviewing the enjoyment of the riding and swimming programs, the expertise of LCC’s instructors, and the opportunities for community members to volunteer to keep the programs going strong, another beneficial dimension for LCC’s young adult participants was discussed. LCC’s founders’ exceptional idea of finding fulfilling jobs for these young adults in the community was introduced. The panel explained to Valerie and her television audience that “The Club at Las Campanas” has already stepped up, and plans to offer meaningful employment opportunities to two of LCC’s young adults: Christian Woodard and Marissa Le Rouge. Channel 16 Comcast on Sunday 7:30pm; Wednesday 7:30pm and Thursday 6:00pm. It also airs on channel 28 Comcast on Sunday 8:30 am; Monday 11:30am; Tuesday 7:30am; Wednesday 6:00am and Friday 3:18pm. Can You Hear the Trumpet Sound? In days of old, the king sent out his royal messengers, called heralds, to the surrounding villages of his kingdom to deliver messages, announce decisions, declare laws, issue orders, and tell of coming events. The heralds were protected by the king. It was a crime to interfere with their work or to harm them. To get the attention of the people, the message of the royal herald was often introduced by the sound of a trumpet-like instrument. Those who did not hear the news directly from the herald, heard by word of mouth any edict that would impact their lives. Centuries later, invention and technology brought the world air wave communication. Radio and television were used to inform the masses. In this amazing day and Internet age, we have several more means to capture the attention of people to inform them of opportunity and to enlist their help. Tomorrow, using television as a well-known ” herald”, four representatives will speak about Las Campanas Compadres when they join County Clerk, Valerie Espinoza, at the Santa Fe Community College’s public television station to record “Santa Fe County Today.” Valerie’s program is designed to introduce the public to people in Santa Fe County and to inform the public about organizations which enrich the lives of its members. In a half-hour program information will be shared by Lawrence and Suzanna Becerra regarding the mission of the LCC riding and swimming programs and the efforts to help LCC participants gain employment. LCC’s fundraising efforts through the Albertsons Community Card program, and the 6% of sales Amazon’s share program will be explained to Valerie. She will be presented her own Albertsons Community card by newest LCC board member, John (Mad Dog) Romero. The interviewed panel will provide the newest details for the Labor Day Mini-triathlon. Pam Franco will enlighten the public about her part in hosting the event at Las Campanas, and details on how the community can participate will be shared. Las Campanas Compadres appreciate Valerie Espinoza’s invitation to again appear on the public channel 16 show, “Santa Fe County Today” to get the word out about its efforts to make our community a better “kingdom”. Valerie will help LCC by referring viewers to the the LCC website, the LCC “Facebook,” and this very blog. Las Campanas Compadres has a friend in Valerie Espinoza, and in her generous ability to inform the public and herald the LCC message far and wide.